The ELIET MAESTRO offers excellent output and efficiency and a seemingly endless capacity. The chopper tackles the green waste from kitchen and garden like a champion. As there is a great variety of waste to be composted, the MAESTRO is perfectly able to play all the trump cards of the unique ELIET Chopping principle. It is beyond imagination what different kinds of waste the machine processes. Due to the special configuration of the knives, not a single piece of green waste escapes. You will gradually have to get used to the fact that the bin bag for vegetables, fruit and garden waste is no longer needed. The high number of chopping movements produces extremely finely chopped material which is perfect for composting. The collecting bag of the shredder does a clean job, as well, and additionally allows for the easy transport of the chips to the compost container. The content of one full collection bag easily fills a wheel barrow. Last but not least - the ELIET MAESTRO is a compact machine which can be transported to the remotest corners of your garden. Incredible 36,000 chops per minute for excellent output and efficiency and a seemingly endless capacity. 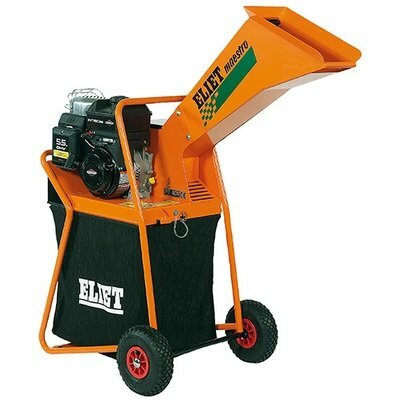 Employs the unique Eliet Chopping Principle enabling a great variety of waste to be composted. Tackles green waste from kitchen and garden. Special configuration of the knives ensure not a single piece of green escapes. The the high number of chopping movements produces extremely finely chopped material which is perfect for rapid composting. Wide loading hopper for ease of use and maximum efficiency. All steel construction with protective epoxy paint for robustness and years of use. The shredding chamber has a double wall with sound absorbing material to reduce the noise pollution from the shredder. Large capacity portable collection bag ensures no waste is left on the ground for you to clear up afterwards. Long openings underneath the feed-in hopper enable the operator to quickly check the content of the collection bag. Large 25 cm transport wheels with pneumatic tyres for easy movement between different parts of the garden and greater stability during shredding.